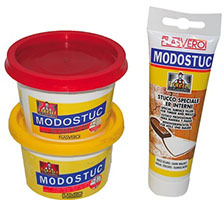 Modostuc is specifically formulated for use on wood, but it’s properties also make it an excellent choice for use on wall, ceramic, porcelain and more. It’s easy to apply, dries rapidly and is odor free. Because of it’s unique properties it’s the filler of choice by professional art conservators and restoration specialists. Professional restorers use Modostuc to not only restore wood but even to reconstruct broken or missing parts of woodwork and frames. It’s even used to build up missing parts of wood and chalk sculptures. Another reason pros love Modostuc is that it accepts finishing varnishes that enable a touch up to literally become invisible. You can also use pigments and colorants to match color exactly. Iron oxide pigments are recommended for coloring Modostuc as the other options can cause combatility issues if the object needs to be covered by a finish.